So, what it is that every bride secretly wants of her ideal white elopement dress? First of all, don’t forget that the very idea of a secret wedding is simplicity and comfort. It is especially important, as this little celebration of your is for the nearest and dearest, or even just for the two of you only. And when you decide to play it sweet and simple, you open a lot of opportunities to express yourself. Take a look at our amazing collection of elope wedding dresses any bride can dream of! Lace is the most common material for a wedding gown. It gives a simple white dress that bridal look you want to achieve. Just choose a dress of casual length and silhouette to keep it simple. Despite the fact that your ceremony might be not as posh as some, your elopement dress still can be a fashion statement. Feather skirt will add elegance to your bridal outfit. Be the most sophisticated bride in that city hall! Cap sleeves will let you show off your arm as you walk down the aisle. They also make you look even more feminine. Perfect for the elopement! A simple sheath dress is always in fashion. Also, its minimalist style works in any setting. A collared dress is as casual as you can get for your elopement. You can wear it with sneakers and it will still look perfect! If you love the classic look of a ball gown, try a voluminous dress with a shorter hemline. An extremely feminine outfit! Coco Chanel was right about the little black dress. In fact, any woman looks marvelous with this simple, yet so sophisticated classical look! If you are a fan of LBD, why don’t you choose its opposite, the little white dress, for the wedding? These short dresses perfectly suit the idea of elopement wedding (especially if you consider elopement travel). At the same time, LWD is pretty practical, as you will be able to wear it later. Lace – Timeless and the most romantic of all bridal materials, lace stays in trend no matter what. Unruffled – Oh, the pure simplicity if this classic look! Bohemian Rhapsody – Exactly what your boho wedding needs! 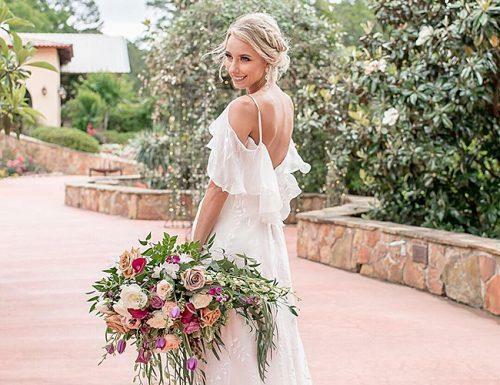 Flower Power – A hippie-inspired dress is among those simple wedding dresses for eloping that can keep it nice and sweet. Pleated dress – Light and airy, a pleated dress will steal his heart all over again! Talking of boho outfits – elope wedding dresses are so much more than a simple option for a city hall! These dresses are perfect for small and intimate weddings. Bohemian weddings, rustic weddings, destination weddings, second marriages, vow renewals, or backyard weddings – you name it! Forget about bulky bridal gowns! The bohemian outfit would make an awesome beach elope wedding dress. Flowing fabrics, a flower crown, and light materials are exactly what you need to keep it sweet and simple. It’s time to show the world your love for art, travel, and free-spiritedness! And don’t forget to check out our destination tips to help you choose the best place for your elopement! The positive side of elopement is you don’t need to focus on a dress at all! First of all, your options are pretty much limitless: cocktail dresses, evening gowns, pantsuits, jumpsuits… Elope weddings are all about reflecting who you are, so don’t be shy to show off a bit of your personality! You can even forget the white for a bit of some other color – peach, blush, or pale blue. Bridal Jumpsuits – A sleek and chic strapless jumpsuit is exactly what a modern bride needs! Bridal Pantsuit – An elegant white or ivory suit make a sophisticated bridal outfit without the formalities of a wedding gown. Floral-Print Wedding Dress – If you are looking for a more casual elopement dress, you can try a floral dress. 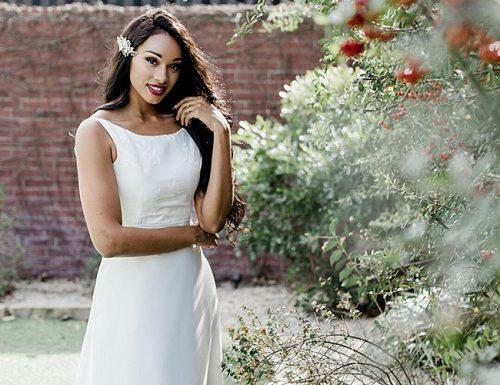 Don’t miss your chance to look fresh and relaxed on your wedding day! Bridal Sweater and Skirt – Thinking about elopement dresses for fall? A simple and chic sweater and skirt combo will keep you warm. 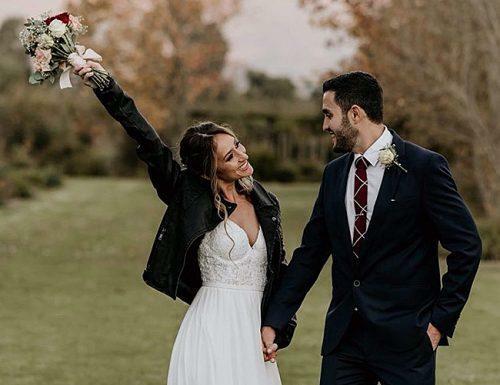 Bridal Moto Jacket – It’s hard to imagine a more fitting elopement outfit, than a lace moto jacket and an airy tulle skirt. Forget romantic elope wedding dresses, feel the good old rock’n’roll vibes! Overall, it doesn’t matter which style you are going to choose. Anything that makes you shine will do on your big day for just the two of you!